PIG DESTROYER has returned to assault the eardrums of a masochistic audience that wants nothing less. The grindcore legend has never allowed the expectations and demands of the (un)healthy segment of grindcore purists to restrain its artistic pursuits. PIG DESTROYER has waved the grindcore flag with pride, and the band has also been key in turning it upside down and challenging the idea of what grindcore is. Indeed, sometimes the group has contributed to the expansion of the boundaries, while fearlessly stepping outside of them altogether at other times as they did with the epic doom track "Natasha", an experimental adventure that was tagged on to its 2004 full-length: "Terrifyer". 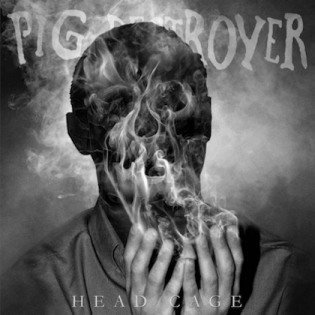 PIG DESTROYER's boldness has never been so pronounced as it is now on "Head Cage". The album's a genre-bouncing affair that's streamlined in focus and intent at particular sections, yet free flowing and sprawling in overall scope. The transitions are unpredictable yet seamless and satisfying. Simply put, there is a lot going on throughout the record, and everything is pieced together in a manner that makes sense. It isn't likely to tickle the pickle of the kinds of grind fans who perpetually seek bands rehashing old AGATHOCLES seven-inches, but it's inevitably going to shine bright in the eyes of those who have favorably viewed PIG DESTROYER since its transition from pure grind to beyond with the aforementioned "Terrifyer" and "Phantom Limb". Whether the group is grinding along like a speed demon, redirecting its belligerence into a mid-paced, bottom heavy stomp, or broadening its horizons with progressive, forward thinking and evocative flourishes that retain a grimy and gritty edge, it remains compelling throughout. PIG DESTROYER's impressive capabilities are on full display as it serves up a smorgasbord of sound on "Head Cage", the ensemble's most dynamic and accessible album to date. As elementary as the point may be, because of how dramatic and exponential its progress has been at certain moments in its career, PIG DESTROYER's growth can largely be attributed to personnel shifts. Original drummer Brian Harvey was no slouch. His style was violent and utterly explosive, traits that his successor boasts as well; however, Adam Jarvis, who joined for 2012's "Book Burner", is exceptionally more potent and controlled. But one of PIG DESTROYER's most dramatic turning points was with the addition of Blake Harrison for 2007's "Phantom Limb". Never mind that the release marked the group's first plunge into writing material that has since been more accessible than what came before. Harrison's samples expanded the scope of what the band was all about. It was more atmospheric and decidedly darker than the bare-bones delivery of what was a trio up until that point. With "Head Cage", PIG DESTROYER's scope has substantially increased yet again, this time around with the addition of the group's first bassist, drummer Adam Jarvis's cousin, John Jarvis. Beyond the obvious fact that his bass lines thicken Scott Hull's strangulating yet almost hummable, savage riffs, John Jarvis's presence allows PIG DESTROYER to develop concepts further. It anchors everything around itself allowing for a new liberty to wander before eventually and inevitably conjoining in a synchronized assault. The vocalists from Hull and John Jarvis's project AGORAPHOBIC NOSEBLEED, Richard Johnson and Kat Katz, are among the guests who add noticeable spice to the mix. Johnson's burly barking adds a considerable amount of angst to J.R. Hayes's scathing vocal assault in the extremely topical track "Army of Cops", while Katz banshee like wailing shines on the blistering "Terminal Itch" and the gargantuan, GODFLESH-esque number "Concrete Beast". Cherry-picking highlights becomes an endless endeavor on an album as impressive as "Head Cage". PIG DESTROYER may have just unleashed the best heavy album of the year, one that pushes grindcore further into uncharted territory.